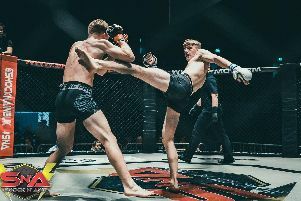 Elliott Hoye believes his decision-making was the key reason behind a dominant TKO victory over Luke Shanks. The flyweight, who trains out of Southsea's Gym 01, delivered a third-round win on BAMMA Fight Night London last week to move his professional record to 2-0. Hoye always looked comfortable at the prestigious York Hall and handed his Northampton-based opponent his first career defeat. Despite having less experience than Shanks in the professional ranks, the Brighton ace dominated on his feet and on the ground. His relentless pressure eventually told, with Hoye stopping Shanks 1min 57sec into the final round. And Hoye reckons his composure inside the cage was significant in the success. The Gym 01 charge said: ‘It was the performance I expected to put on and it was nice to go out there against someone who had a better record and win. ‘He was a lot more dangerous on paper but we knew I was going to start taking these sort of guys out sooner rather than later. ‘I felt very comfortable in there. I knew he was tough and was going to be solid in the first three or four minutes. ‘But then I started to figure him out and he began to realise he was behind on the cards. ‘He started getting desperate and then it panned out like we thought it would. ‘He’s a skilled guy but my decision-making was better inside the cage. He knew what to do but I was a little bit quicker off the mark. ‘When he started getting behind, he started to crumble and the disparity became larger. After fighting on one of the UK’s biggest MMA cards, Hoye now hopes he’ll be offered more contests. And he has set his sights on two more victories this year. Hoye added: ‘It’s looking like I'm now going to get some more fights with BAMMA. ‘I’ll finalise that with Brian (Adams) when I get back to the gym at the end of the week. ‘At the moment, it’s looking like I'll get back into the cage at the end of September. ‘Nothing is finalised yet but I want to have at least two more fights before the end of the year – September and November.